At Death & Co. in New York, bartender Shannon Tebay Sidle experiments with yogurt in both sweet and savory drinks. 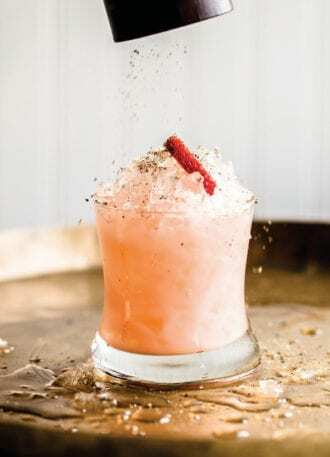 This recipe, featured in Maggie Hoffman’s book The One-Bottle Cocktail, combines unsweetened yogurt with strawberry, lemon, honey, gin and black pepper. “The Greek yogurt gives the cocktail a tangy flavor and subtly creamy texture,” says Hoffman. Combine the strawberries, lemon juice and honey in a shaker and muddle until well broken up. Add the gin and yogurt and fill the shaker with ice. Shake until chilled, about 15 seconds. Double-strain into a rocks glass filled with crushed ice. Garnish. Reprinted with permission from The One-Bottle Cocktail by Maggie Hoffman, copyright © 2018. Published by Ten Speed Press, an imprint of Penguin Random House LLC. This classic Italian amaro gets a boozy boost and expanded distribution in a booming category.